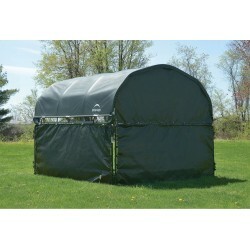 Shop ShelterLogic brand corral shelters for your livestock. ShelterLogic's corral shelters will go over your existing corral to keep your animals dry when it rains and offer some shade on hot days. Bottom panels are also offered to cover the walls for even more protection from storms and wind. Free Shipping on all orders! 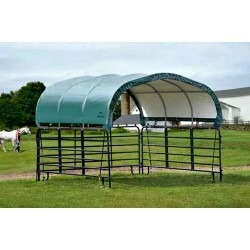 AG Shelter Series - Retail Corral Shelter. 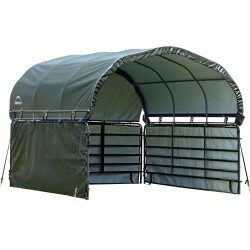 A cover for corral panels to shade and protect livestock. 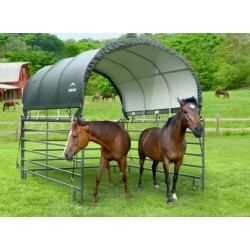 The Corral Shelter livestock shade is a multi-purpose, portable shade and shelter structure and one of our most convenient equine innovations, yet.